Last month, I provided three ways to build links in the age of Google Penguin–Google’s algorithm change which severely limits effective link building. One of the link-building methods I promoted involves building internal links. If you have a strong domain authority for your site, your internal links might be low-hanging fruit for your link-building efforts post Penguin. Mike Moran, the editor of this site, worried that internal linking would become just another negative ranking factor for Google once companies realize how it helps them improve ranking. This is a valid concern because of Google’s tendency to quash widespread SEO tactics. So I thought I’d devote a whole blog post on how to avoid negative penalties from internal link building. Relevance: Before you rush off and create links from every page in your domain to every other page in your domain, a loud note of caution. This will look like gaming the system. The key is to create relevant links. With each internal link you build, ask yourself if your target audience will want to click it. If the answer is, “probably not,” don’t bother. You still are designing your experiences for your users first. But in the age of Penguin, high-quality, relevant internal links can help with ranking. This passage begs the question: What are relevant links? Perhaps a better way of phrasing the question is how do I know whether a link is relevant enough? These are tough questions that don’t admit of universal answers. But on marketing sites, there are a few simple rules to follow in building relevant links. They all boil down to one simple principle: Links should create good user experiences. Most marketing sites are built like a funnel. When you draw new users into them through search and social media, you can’t presume that they know what you do or how you define things. So you need a layer of fairly basic learning content that speaks to them on their terms and helps them understand your points of view on the issues they face. From there, perhaps you help them solve generic problems related to these issues with advice and case studies on common solutions. Then perhaps you help them compare and contrast different ways to solve the same problems using your products or services. And finally you help them buy the right combination of products and services to solve their problems. This is sometimes called customer progression. Each link in this chain helps them take the logical next step in their customer journey, which is why I call these stepping-stone links. Users sometimes click the wrong thing. Perhaps you used generic link anchor text like click here instead of something more descriptive. Perhaps you were scant on your short description or the graphic near the link. For whatever reason, they land on a page and realize it is not relevant to their present information needs. Rather than forcing them to hit the Back button, give them an easier way back. Back-up links are always relevant enough for Google because it’s just good user experience. One way to discover relevant links in your environment is to perform an internal search on your own site. (There are, of course, more sophisticated content analytics tools to learn the semantic relationships between your content, but internal search is universal.) You might discover that you have several apparently duplicate pages, which is an opportunity to consolidate, as I recommend in a previous post. But you also might find pages that are highly relevant to your users. For example, you might find a case study that supports your point of view. This is an example of how I define relevance. If you think of a content strategy as a story that progresses from one page or asset to another, like chapters in a book, the next chapter in the story is a highly relevant link. I set these apart from stepping-stone links because not all stories involve customer progression. Some marketing stories are just that: Compellingly presented points of view. In large organizations, the story is crowd sourced in the sense that lots of teams create content without prior knowledge of complementary efforts, especially in the age of social content. Building story links in these environments is a matter of curating content from multiple sources into one compelling presentation. That’s the best kind of internal link building. 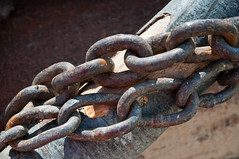 Take great care in building internal links not to overdo it. But if you limit them to the three types above, you should have no problems with negative ranking factors in Google. Is your marketing still getting attention instead of paying attention?